I would like to share the progress on Travis’ school. Here is a picture of the new dorm, almost finished. We will continue the half wall around the bottom, and then put lattice work around the top of the half wall in order to enclose it completely. We still need to do a little digging behind the dorm for drainage, and will use the dirt to finish the landscaping in front of the building. We are currently using the building as a dorm for the children, and deans residence. The kitchen is temporarily located in one corner of the downstairs. Under the porch is our locked storage room for all our valuables. 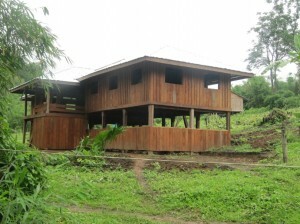 It has been a real blessing to have the opportunity to build using lasting materials instead of bamboo. 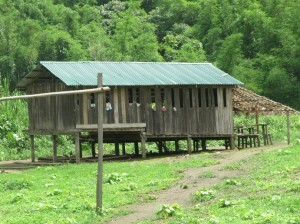 We would like to build a large school building to accommodate a ten grade school. The school building would be three and a half times the size of the dorm, which will cost approximately $10,000. Even though this sounds like a lot of money, we have learned that God always provides exactly what we need when we need it for His work. We also want to build a kitchen, and a bath/ laundry area. These buildings will be relatively inexpensive. Our plan is to begin working on excavating for all of these buildings while we are waiting for God to provide the means. 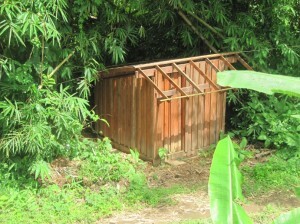 The temporary outhouse, minus the roofing. 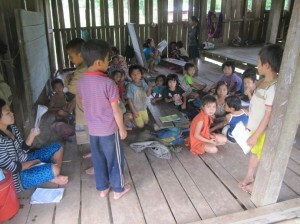 Our school is operating with 6 teachers and 31 students in eight different grades at this time. We have a good Christian program that we will continue to improve as we go. We are currently planting gardens to provide food for the students. We plan to plant lots of fruit trees, including coconut, mango, jackfruit, rambutan, limes, etc…It sure would be nice if we had a rototiller! 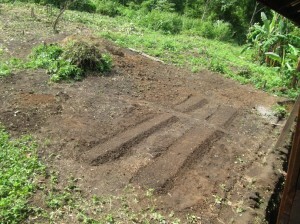 Right now all the agriculture is done by hand using primitive tools. 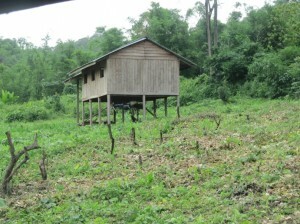 It makes us feel really good to see the jungle receding, and vegetables and fruit trees taking it’s place. I could tell you about miracle after miracle that has happened to make all this possible, but there is not enough time or space. It is clear to us that God is the one to give the glory to for making all this happen.